We all know that melons have a cooling property. No wonder they are in abundance during the summer heat. Honeydew melons have slowly started appearing on the market in Mombasa. I love the ones that come from Voi. They tend to be juicy and sweet, most of the times. Can’t say the same about the local oranges. Even if some of the fruits come from Tanzania our neighbouring country, its still labelled as local and not imported, like the grapes, apples, oranges from South Africa. There are carts full of these oranges everywhere. The first time I bought them from a seller near the temple, he promised me they were sweet oranges from Tanzania. I took them home, juicer and everything ready to squeeze them. Most of them turned out dry . The second time I bought them from the market, thinking yes its a more reliable place. I was told very tamu (sweet) from Tanzania. So again I go home with a kilo of them. Squeeze them, leave the juice in the fridge and when its cool, I took a sip and yuck! Was I drinking orange juice or lime juice? So back it goes into the fridge. My brains are now working overtime to use up the sour juice. Yes, I made a healthy drink out of it. Extremely cooling and refreshing on a hot humid day. In India, these oranges are called sweet lime. But I still don’t know how to differentiate between the oranges from Tanzania and Kenya. Layer the melon pieces on a small tray or a wide container. Freeze them. 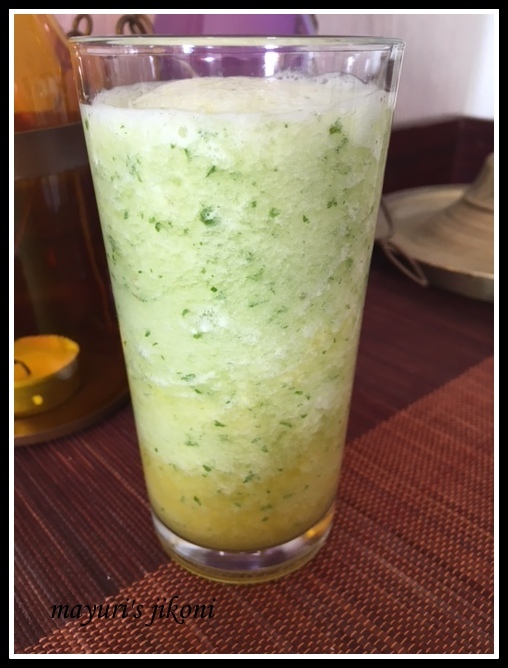 Mix orange juice, frozen melon, honey, basil leaves and salt in a blender. Liquidize into a smooth liquid. If you don’t have frozen melon cubes, just serve the smoothie with crushed ice. If the orange juice and melon are sweet, you may need less or no honey. Taste before serving. If the orange juice is sweet, then add 2 tsp lemon juice to give that slight tangy taste. Use artificial sweetener for diabetics.